We like to do things to excess here in the shiny emirate and this year’s Dubai Food Festival is no exception. Now in its fifth iteration, this year’s annual big bingefest has more events than a herd of ruminants has stomachs. Whether it’s discounts at posh restaurants, Michelin-brushed masterclasses or experiential journeys into urban farms, you’re going to have to loosen your belts and let out your trousers for two weeks of culinary craziness. “Over the years, Dubai Food Festival has become a platform for people across Dubai to connect over their love of food with its signature calendar of events and irresistible promotions,” says Ahmad Al Khaja, Chief Executive Officer, Dubai Festivals & Retail Establishment. So although – spoiler alert! – there are fewer celebrity chefs than before, there’s still plenty to do. 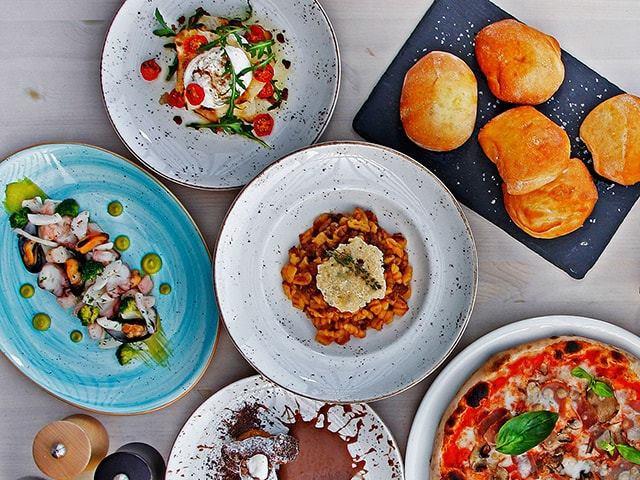 The mainstays are back, including the flagship Etisalat Beach Canteen, Dubai Restaurant Week and Taste of Dubai, but there are plenty of sides across the city, such as chefs’ tables, cooking demos and even weekend workouts and talent shows. We kid you not. It all goes a long way to whetting global appetites (we couldn’t help ourselves) for all things Dubai. “Gastronomy is one of the key pillars of our destination proposition. We actively seek to promote Dubai as a culinary hub, regionally and globally,” Al Khaja continues. Where are those sellabrities, then? Last year they turned up unexpectedly at restaurants and in street markets around the city in the way that we’ve now become accustomed to. It seems they grab too much attention — IRL or on social media. OK, enough chat. We’ve curated a platter of gluttonous highlights so you can indulge to excess over the next fortnight. See you on the other side of the food coma! Food trucks, pop-up stalls, and amazingly, no sand on your plate. That’s pretty much the promise of the Etisalat Beach Canteen, which is the unofficial DFF headquarters until March 10. Sited behind Sunset Mall on Kite Beach. This is where you register and pick up tickets for DFF activities, try your hand at a masterclass (or a #selfiewithachef), kick back to a DJ, let the kids run wild and practice your downward dog before trying out food from nearly 40 different brands. If you're trying to get there, DON'T pick the Dubai Food Festival's Beach Canteen pin on Google Maps. It takes you to the old site, several kilometres away. Most important, there are two family-friendly Beach Brunches, held on February 23 and March 1. Or follow along to recipes with chefs from across the country and from TV. Gypsy chef David Myers shows off his bold food combinations today. On March 3, Dalia Dogmoch of Dalia’s Kitchen hosts a Cook for Syria initiative, and Chef Vinu Raveendran from Carnival by Tresind demonstrates a Lentil Cappuccino. There’s chocolate-making and tasting each Saturday at 5.30pm with Boutique Le Chocolate, and the Dubai International Kite Fest closes out the event on March 9 and 10. Stop off at Zapiekanka for a Polish open-faced toastie, Nablus for artisan kunafah, Bait Maryam for home-style Levantine food, the self-explanatory Tacos Arabes, Poke Poke and Take a Bao, and wash it all down with street-style karak at Project Chaiwala. Our favourite bit of DFF is always Dubai Restaurant Week, where you can tuck into fine fare without a fine bill at the end. There are 15 different restaurants taking part this year, spanning some 10 different cuisines. Choose from newbie Toro+Ko (read our review next week) to The Atlantic, Jean Georges, Lima and Gordon Ramsay’s Bread Street Kitchen and Bar. You only pay Dh199 per head for a three-course meal, water included. Starts on February 22 until March 3 to live the high life. Bit random this one, you might think — but if there’s a nation that loves to eat more than the UAE (and possibly Singapore), it’s the Kuwaitis. With the country’s national day on Sunday, Dubai’s celebrating with graffiti artists, traditional bands, an insight into the cuisine of the Northern Gulf by the country’s top chef Jameela Al Lenqawi and a concert tomorrow by Bader AlShaibi. Plus there’ll be fireworks! Today and tomorrow at Etisalat Beach Canteen. Are you one of those who hates going to New Dubai because of the traffic? We hear you. Perhaps the chance to try tapas-style menus from Dh10 per dish will tempt you to go down. Retail operator Meraas has its own mini food event, Bites at The Beach, over DFF, with alfresco communal tables to encourage city denizens to make new friends beside the seaside. If you eat at six participating restaurants, you can enter a draw to win Dh1,000 in spending vouchers at The Beach. Bianca Mozzarella & Co’s montanara rossa (deep-fried pizza dough, Dh20), Bombay Bungalow’s lovely kebabs (Dh25), cheese kofta from Butcha, salmon and farro risotto from Bouchon Bakery, fuzzi cones at Fuzziwig’s Candy Factory and mini truffle burgers from Leopold’s of London (Dh30). Or head to Emirati favourite Seven Sands for a Dh56 set menu. 10am to midnight on weekdays and until 1am on weekends. Long-time residents were piqued for a moment when the first Hidden Gems list was released a few festivals ago — nobody wants their favourite eateries overwhelmed with stomach traffic from across town. But sharing is caring, so we’re all OK now with telling you about this year’s list of top 10 hideaways in neighbourhoods you wouldn’t normally go to, whittled down from a list of 35 by city voters. Upping the ante is a Dh25 dinner deal at a different restaurant every night through DFF. Head to JLT institution Ayubowan for Sri Lankan, or discover the truth about Filipino food at Karama’s Hot Palayok. Fish Hut near Oud Metha’s Ismaili Centre — home to a stunning chargrilled catch with gooseberry and chilli sauce — tops the charts with 3,000 votes, so head over for a two-course meal at Dh25 on Monday, February 25. All the way from London comes a Michelin-starred tradition: the Apple Tarte Tatin Challenge, which chef brothers Chris and Jeff Galvin bring to Galvin Dubai. Baking fiends can recreate their own tarte tatin recipe after watching Chef Luigi Vespero create the brand’s signature dessert at the Etisalat Beach Canteen at 7pm on February 26, and then post the finished product on their respective public social media pages using the tag #GalvinDubaiAppleTatin. A shortlist of 10 will be chosen and invited down to Galvin Dubai where the winner will be named. "Jeff and I have always loved apple pies and tarte Tatin is always on our menu. It is also a great test for any chef — you give them the same ingredients and they make it in pretty much the same way, yet you get 10 different pies,” says Chris Galvin. Email reservations@galvindubai.com or log on to galvindubai.com. Pricing details unavailable. Culinary whizkid John Martho Buenaventura takes green freaks and food fanatics through his pride and joy — a hydroponic greenhouse built on the balcony of his Mediterranean restaurant Cuisinero Uno. With an experiential planting session and a one-hour lesson on making healthy smoothies and mocktails ahead of the summer, he says the aim is to educate diners about sustainability and encourage them to grow their own fruit and veg at home. Yes, the city has a street food scene and it’s being tarted up nicely for the duration of DFF. Among the highlights is Bollywood Parks Dubai, which is hosting a food bazaar that is Streets of India this weekend. Or go down to Al Seef from March 1 to 3 for its Dubai Street Nights events. You could also tuck into Thai at The Backyard, Steigenberger Hotel on Saturday evenings during the festival. Finally, stop by the Etisalat Beach Canteen for the first ever Dubai Street Food Awards on March 10. Catch up on your celluloid backlog at the outdoor cinemas at Last Exit E11 and Last Exit Mad X. Over the three weekends of DFF, the kitschy drive-up parks are screening a range of movies, beginning with the Rogue One: A Star Wars Story. Grab a bite from one of the food trucks, lie back on a bean bag and allow yourself to be entertained. Gather round for an intimate dinner party in a chic French farmhouse-inspired restaurant as award-winning chef David Myers, whose Los Angeles restaurant Sona had a Michelin star before it closed in 2010, and his colleague Alex hosts chefs’ tables at the new Bleu Blanc venue at the Renaissance Downtown Hotel, where he plates up signature dishes at his grill counter while taking guests on a culinary journey with stories from his extensive travels around the globe. Limited to six guests per table, this weekend’s slots with Myers are already sold out, but Chef Alex brings his own special charm to friendly dinners over the DFF. Take a masterclass with Sanjeev Kapoor, Reza Mohammad and Jenny Morris. If there’s just one thing you do at DFF, make sure you head to Taste of Dubai, the traditional festival closer, and a family fest in itself. Take a masterclass with Italian chefs with Michelin-starred restaurants: we’re rather keen on Silvia Baracchi of Il Falconiere Restaurant & Spa and Maria Grazia Soncini of La Capanna di Eraclio. Or you can pit your wits against other Dubai residents in the event’s annual cooking challenge, where you cook alongside celebrity chefs Jenny Morris, Reza Mohammad, Sanjeev Kapoor, Eric Lanlard, Jun Tanaka, Valentine Warner and Annabel Karmel. When you’re done competing, tuck into sampler portions of over 100 signature dishes (sampler portions!) from the likes of Nobu, Jodhpur, Le Petit Belge, Sonamu, Shanghai Chic, Weslodge and newbie Guy Fieri’s Kitchen & Bar. Learn how to make mozzarella, gelato, how to cook with butter and cheese, or simply sit back and take in the entertainment, from Eighties act Sister Sledge’s Kathy Sledge on March 8, to DJs, an acrobatic pizza chef and other food-themed acts. “Bring an appetite, wear comfortable footwear and you’re halfway to having a jolly time at Taste of Dubai,” says Event Director Anju Chadda.